Designed by Epson, a leader in digital imaging, the GT-S50 offers robust paper handling capabilities and quality you can depend on — all from a compact, desktop scanner. The Epson WorkForce Pro GT-S50 features 10 user-definable scan jobs displayed on 2 line x 16 character LCD. 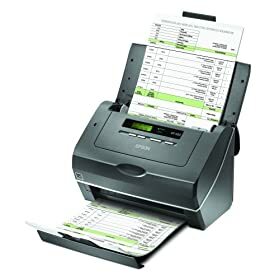 The Epson WorkForce Pro GT-S50’s versatile automatic document feeder can scan documents, business cards and plastic ID cards. The Epson WorkForce Pro GT-S50 features 10 user-definable scan jobs for easy one-touch scanning including Scan to PDF. The Epson Event Manager software allows you to create customized scan jobs specifying resolution, file output type, image type and whether an image is saved to a file or launched into another application. Unlike other scanners where scan jobs are displayed only as a number, the WorkForce Pro GT-S50’s 2 line x 16 character LCD displays scan jobs with job titles and settings making it easy to choose and start a scan. In order to fit into any document management environment, the Epson WorkForce Pro GT-S50 both Epson Scan TWAIN and EMC Captiva ISIS drivers for compatibility with key document management standards and software applications. The WorkForce Pro GT-S50 has also been certified by Kofax, a leader in document imaging software. The Epson WorkForce Pro GT-S50 features a 75-page automatic document feeder capable of scan speeds up to 25 ppm simplex, 50 ipm duplex (200 dpi, A4-size, Speed Priority scanning mode). With its dual CCD sensors, the WorkForce Pro GT-S50 is able to scan both sides of a sheet in just one pass. The ADF can also scan plastic, embossed and rigid ID cards, capturing both sides of the card in a single pass. With the included carrier sheet, the GT-S50 can also scan receipts and other small or fragile documents. The WorkForce Pro GT-S50 offers a host of features in a compact, desktop scanner. 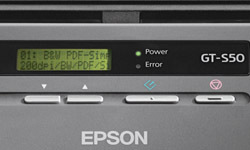 The Epson scanner driver offers a host of innovative functions including automatic paper size detection, automatic hole-punch removal, automatic de-skewing, background color removal and much more. This energy-efficient light source uses less power, while offering greater productivity. And, there's no warmup required. Best of all, with no mercury included, this LED technology is better for the environment. Each Epson WorkForce Pro GT-S50 is backed by exceptional service and support. The WorkForce Pro GT-S50 includes a one-year warranty with extended warranties and overnight exchange programs also available. The GT-S50 also features an affordable user-replaceable roller assembly to keep the scanner working at peak performance even in heavy workloads. Epson WorkForce Pro GT-S50 document imaging scanner; Scanner installation CD-ROM and Electronic User’s Guide; Nuance ScanSoft® PaperPort® CD-ROM; Start Here poster; Hi-Speed USB 2.0 cable; AC adapter with power cable; Carrier sheet.